Ocean is shown in front of a statue of Novak Djokovic, the Serbian tennis star and current world’s number one men’s tennis player. 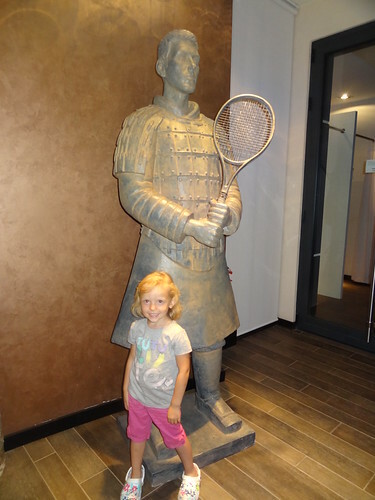 He got the statue from the Master’s Championship in Beijing last year. It is in the style of the terracotta warriors from the famous archeological site. 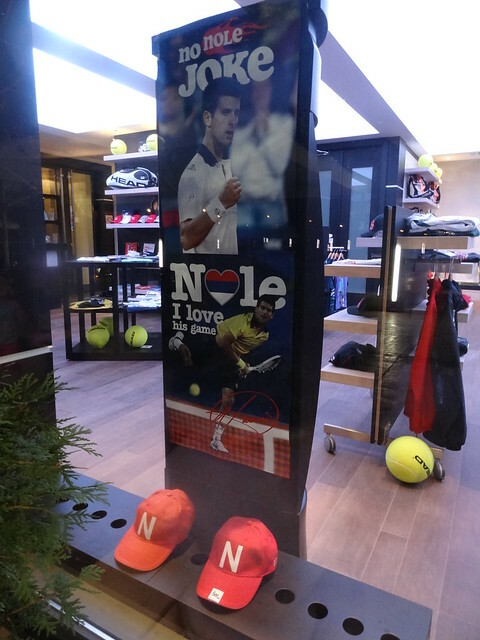 We visited the Novak Tennis Center in downtown Belgrade last night. The family with the help of the city has created a tennis center that can host an ATP tourney as well as become a tennis academy. We looked around and will book a court for later this week. They had some reasonable prices and the club seemed very nice. I’ll do a blog post when we play. Djokovic won the Roger’s Cup last night in Montreal, Canada. He raised his record to an amazing 53-1 this year. That is a 98% winning percentage and he is on pace to beat the best single season record ever of 82-3 set by John McEnroe. His 43 consecutive wins to start the season was the most since the ATP era began in 1990. Only Ivan Lendl (44) and Guillermo Vilas (46) have had longer streaks. Federer’s longest streak was 41 and Nadal’s was 32 wins. The Roger’s Cup victory was his fifth “Master’s” series, also a record in a single season. The Master’s series are tournaments that all the top-ranked players must play and are worth more points and money on the tour. Djokovic skipped the Master’s tourney in Monte Carlo because of a knee injury, otherwise he probably would have had six. He is playing in the Cincinati Masters this week. Besides the Master’s wins, he also won two majors, the Australian and Wimbledon. The US Open begins at the end of this month. Novak also has accumulated almost 8 million dollars in prize money this year and is heading towards the record of Rafael Nadal, who won over 10 million in one season. I don’t think that his season is getting enough attention. I hope he can finish out the season undefeated, it would be a remarkable feat.